In Human Resources, go to Process / Update Payroll from Benefits. In the first row of the Selection Grid choose the medical Benefit ID = AFLAC and Find Now. 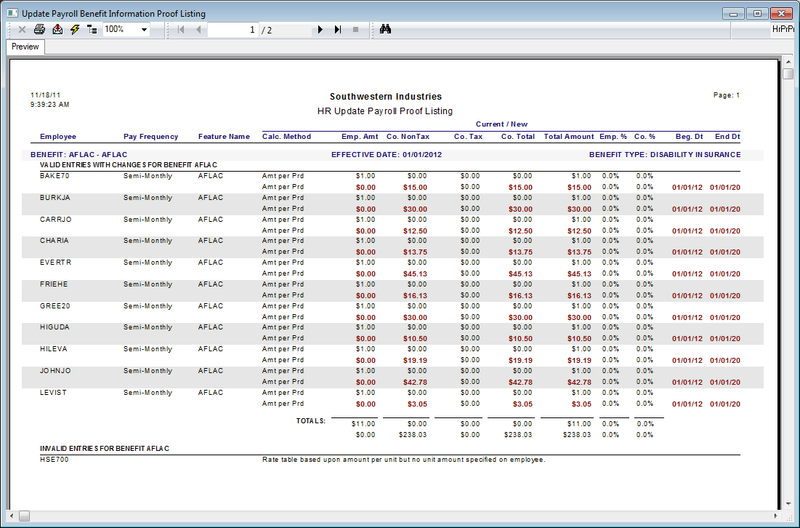 Select all the employees and view the Proof Report. When satisfied with the changes, close the report and choose Update Payroll when finished. If you go back and look at enrolled employees, you will see that the amount per period for the payroll AFLAC feature has been updated. Please Note: This automatically adjusts by period regardless of the payroll frequency. All eligible and selected employees have now been updated in Payroll. Now that you have created the AFLAC benefit, making changes or enrolling employees is a simple process. You will notice that all employee values in the Elected Amt field are retained. If this amount changes on the AFLAC invoice or if a new employee enrolls, simply update this grid and repeat the steps above for pushing the benefit to Payroll.